Obama: Confirm attorney general nominee "without delay"
President Obama formally nominated U.S. Attorney Loretta Lynch to serve as the next attorney general on Saturday, praising Lynch's "commitment to equal justice under the law" and urging the Senate to confirm her "without delay." "It's pretty hard to be more qualified for this job than Loretta," the president said. "Throughout her 30 year career, she has distinguished herself as tough, as fair, [as] an independent lawyer who has twice headed one of the most prominent U.S. attorney's offices in the country." The president lauded Lynch's record as a U.S. attorney, noting her successful track record of prosecuting white collar criminals and terrorists, and praising her handling of volatile civil rights cases. If confirmed, Lynch would be the first African-American woman to take the helm at the Justice Department. She would succeed Attorney General Eric Holder, the first African-American to hold the post. Holder has been on the job since the beginning of Mr. Obama's administration, but he announced in September that he would step down when his successor is confirmed. Lynch has served for four years on an outside panel advising Holder. 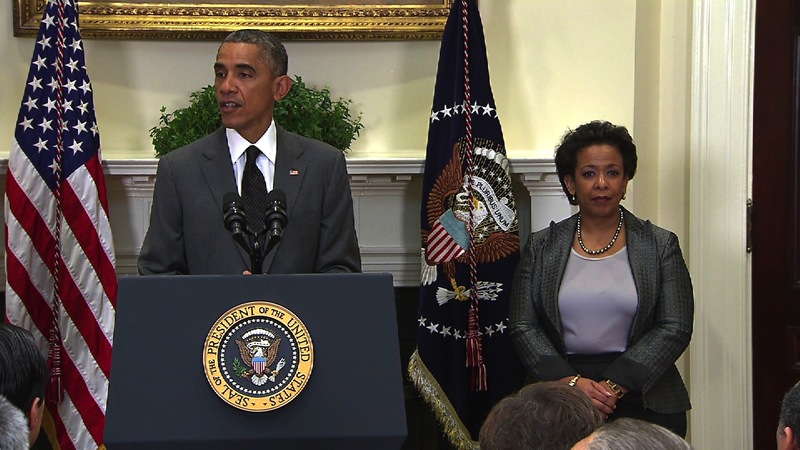 Additionally, in January 2013, Holder appointed Lynch chairwoman of the Attorney General's Advisory Committee. Mr. Obama did not say Saturday whether he would ask the Democratically controlled Congress to take up Lynch's nomination during the lame-duck session or whether he would wait until Republicans take control in January. The president also praised Holder during his announcement Saturday as the attorney general looked on. He thanked Holder for his "outstanding service" and said the nation is "freer and safer" because of Holder's work. In a statement on Saturday, Holder praised Lynch as "an extraordinarily talented attorney, a dedicated public servant, and a leader of considerable experience and consummate skill." "I am certain that she will be an outstanding Attorney General, and I am delighted to join President Obama in congratulating her on this prestigious appointment," Holder said. Lynch, currently the U.S. attorney for the Eastern District of New York, is an accomplished federal prosecutor who earned her undergraduate and law degrees from Harvard University. In her own remarks Saturday, Lynch thanked the president for the faith he's placed in her by putting forward her nomination. "Today I stand before you so thrilled and frankly so humbled to have the opportunity to lead this group of wonderful people," she said. When news about Lynch's impending nomination broke Friday, the immediate reaction from Senate Democrats was positive. In a statement, Sen. Patrick Leahy, D-Vermont, the chairman of the Senate Judiciary Committee, called Lynch an "experienced" prosecutor and nodded at the historic possibility of seeing an African-American woman in the nation's top law enforcement job. Lynch has been confirmed easily by the Senate twice before: once, in 2000, as the U.S. attorney for the Eastern District of New York at the end of then-President Clinton's second term, and again in 2010 for the same job under Mr. Obama. That track record gives the White House hope that her nomination will proceed unencumbered, but Lynch is likely to face tough questioning from Republicans about how her approach to the job would differ from that of Holder, who has feuded regularly with the GOP in his nearly six years on the job. The early reaction from Republicans to Lynch's nomination was noncommittal, offering neither praise nor criticism. Sen. Orrin Hatch, R-Utah, who serves on the Judiciary Committee, pledged a "full and fair confirmation process," but he said the nomination would draw added scrutiny "in light of the troubling abuses under the current attorney general." "I look forward to hearing Ms. Lynch's plans for restoring trust in the Department of Justice," he said. And Sen. Mitch McConnell, R-Kentucky, who's likely to serve as the Senate majority leader in the next Congress and would wield considerable power over Lynch's nomination in that role, warned the president not to try and jam the nomination through the Senate before the new Congress convenes. "Ms. Lynch will receive fair consideration by the Senate," McConnell said in a statement, "and her nomination should be considered in the new Congress through regular order."